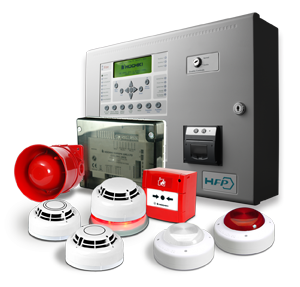 "Our Alarm Division is Fully Trained and Licensed to help with all your Fire Alarm system needs. Including Testing, inspections, installation and service per NFPA72 Fire Alarm codes. We also offer Burglar and Digital Camera system installations to protect your business and/or home and our monitoring service provides you with 24/7, 365 days a year protection.​"
By incorporating fire safety equipment into a monitored alarm system, you can ensure a Site response to any fire safety emergency. Combines both the local audible alarms with notifications of the alarm to the Central Monitoring Service which can dispatch the fire department. Temperature Sensor: A temperature sensor monitors room temperature. This monitoring can prevent pipe freeze ups. Water Sensor: Water sensors are used to detect basement flooding or hot water tank failures.